Cast: Andy Samberg, Isla Fisher, Ian McShane, Sissy Spacek, Will Arnett, Jorma Taccone, Bill Hader, Danny R McBride. Story: Terrible motorbike stuntman crashes a lot. 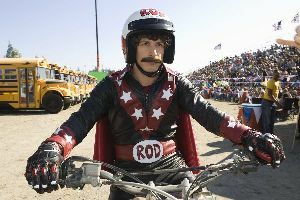 There's no way to describe Hot Rod without referring to Napoleon Dynamite, though the makers would probably rather we didn't, as it can't quite match it. Rod is a motorbike stuntman. Well, a moped stuntman. Well, a moped driver who crashes off ramps a lot. In true Nacho Libre style, his incompetence is no hindrance to his aspirations to raise fifty grand for a heart transplant for his aggressive stepfather. Andy Samberg, who you'll never have heard of unless you watch Saturday Night Live, takes the title role originally meant for Will Ferrell and does a creditable job while looking like a slightly chunkier version of Ashton Kutcher. The cranky stepfather Ian McShane will be recognisable to us Brits as the popular antiques rogue Lovejoy, and to the rest of the world as the foul-mouthed Al Swearengen in Deadwood - here he effectively captures the joy his character finds in winding up and shooting down his underachieving stuntman stepson, while the totty quota is filled by Mrs Ali G - Isla Fisher from Wedding Crashers. In terms of comedy, it's not actually particularly funny. Granted, there are several chuckles to be had, largely provided either by Rod's wonderfully inept crashes or the daft and socially inadequate characters, but on the whole it's a feeling of warmth rather than laughter that we're left with. There's never any doubt about the direction the story's going to go, which is something of a missed opportunity in my book - the other movies in the genre have all been similarly predictable so it's time for one of them to surprise us. Without this desire to try something new, we feel we've seen it all before, and as such it's amiable enough but fails somewhat to fulfil its potential. Hot Rod is a nice, pleasant film, without ever pushing for greatness. You'll remember moments from it - mostly the crashes - but it won't make any lasting impression. Testosterone Satisfaction Rating: 2/5 - Rod stacks his bike regularly, mild profanity including one F word. To enjoy this film you should: like Napoleon Dynamite. Hot Rod was released in the UK on 28th September 2007. I happened to catch this movie on a 'plane back from Singapore. Never have I wished that the in-flight entertainment system would crash. A straight rip-off of Napoleon Dynamite with absolutely nothing going for it at all.